Decadent and bursting with flavors, elegant yet easy to make, you will be serving this one, again and again. 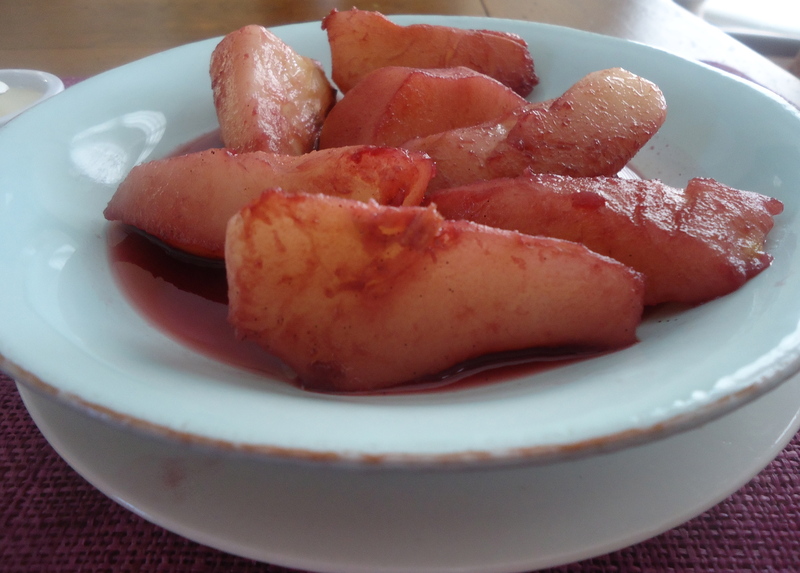 The pears, poached in a good red flavored red wine are just great and light once poached, even more fabulous when served with creme fraiche, mascarpone, or chocolate ice cream on the side! It was a real success at our cooking class last week! Keep this recipe in your collection of fast and amazing desserts to make for the Holidays! Peel, core and slice pears . Then combine in a large saucepan all ingredients, except pears. Bring to boil, when wine is boiling reduce heat to medium low, add pears and let it simmer pears about 5 to 8 minutes, turning once and simmer for 8 to 10 minutes more until pears are soft when poking with a fork. Remove pears on a plate, let them cool on the side. Serve on a large shallow plate, pears pour sauce over, add mascarpone, cream or ice cream for a fantastic dessert!